A month ago, South Africa was shaken to the core by President Jacob Zuma’s late-night Cabinet shake-up, which included the axing of Finance Minister Pravin Gordhan and his deputy Mcebisi Jonas. The events of that week triggered mass public protests, an explosion of the divisions within the ANC and the alliance, and the intensification of efforts by opposition parties and civil society to remove Zuma from office. In an extensive interview at his Pretoria home, Gordhan spoke to RANJENI MUNUSAMY about the events of that fateful week, his relationship with Zuma and his former Cabinet colleagues, the impact of the reshuffle on the National Treasury and why he supports the call for a judicial commission of inquiry into state capture. The morning after President’s Zuma’s midnight reshuffle, a media briefing was hastily convened at the National Treasury in Pretoria when Pravin Gordhan and Mcebisi Jonas addressed the nation for the last time from the building that functions as the heart of the government system. Shell-shocked officials bustled about – concurrent to the media briefing, there was a hive of activity in the minister’s and deputy minister’s offices to pack up their belongings and prepare for the new occupants. After the briefing, Gordhan and Jonas briefly addressed a crowd of Save South Africa supporters outside the Treasury, urging South Africans to become activists and guard the institutions of democracy. As they walked back into the building, teary-eyed officials hugged and snapped pictures of them. As Gordhan waited for the lift, he noticed that one of the government posters on the noticeboard was hanging lopsided. He walked over and pinned it back up. He might have been forced out of his job but he was handing the Treasury over to his successor Malusi Gigaba in tip-top condition. In Gordhan’s office, his staff and members of his family packed his books and personal effects as he continued to bid farewell to senior staff. A mauve tie hung on the coat rack and his briefcase stood next to his desk. They would be the last things to be picked up before he walked out of the Treasury – and thus be cast from his role as South Africa’s chief guardian against malfeasance and abuse of public funds to one of the faces of the resistance against state capture. Now, a month later, the pall of that ill-fated week is still evident even though Gordhan seems to breathe easier and has had time to process what happened. In the month that passed, he celebrated his 68th birthday, as fate would have it, on the same day as Zuma. It is May 1, Worker’s Day, and elsewhere in the country, the consequences of Gordhan’s firing are playing out with Cosatu members rebelling against ANC leaders and demanding that Zuma leave office. Gordhan is standing on the stairs of his Pretoria home as we drive in, looking very unlike the figure South Africans are accustomed to seeing at the parliamentary podium, belting out facts and figures in the National Budget. He and his wife Vanitha had returned from Cape Town the night before where they had to pack up their belongings from the ministerial house they occupied for the past eight years. At that final media briefing, Gordhan and Jonas said they had not been informed by the Presidency about their removal from Cabinet and learnt of it like the rest of South Africa – from the media. I ask if there has since been communication and if Zuma has been in contact to thank him for his service to the country. There has been no contact, Gordhan says, and the only communication was the public statement issued by the Presidency announcing the reshuffle. Zuma’s explanation to ANC officials for the reshuffle was that his relationship with Gordhan had become untenable. The fact that the president could not bring himself to thank Gordhan for his distinguished service to the country as the former Commissioner of the South African Revenue Service (SARS) and then minister who served in two portfolios in his Cabinet seems to support his claim of an “irretrievable” breakdown. But Gordhan remains puzzled by this. He was with the president at a Cabinet meeting the week before his firing and then at an ANC national executive committee (NEC) meeting over the weekend before he left for London on the Sunday night. “There was no indication that anything was amiss,” Gordhan says. There was no fallout, no exchange of words, no meetings to discuss differences, nothing to indicate there was a breakdown in relations. “I know the president from 1974 when we were a bunch of young activists in KZN. People like him, Sunny Singh, the late Judson Khuzwayo and others were released from Robben Island. As far as I am concerned, we have enjoyed a good relationship, particularly in the first term of office. It was a very constructive engagement that we’ve always enjoyed between the Treasury, including myself, and himself… I am not sure where that so-called breakdown comes from,” Gordhan says. But there was clearly antagonism towards him from some of his former Cabinet colleagues, including the Minister of Social Development Bathabile Dlamini and Minister of Water Affairs and Sanitation Nomvula Mokonyane. Dlamini and Mokonyane, who both publicly attacked Gordhan, are among the president’s closest allies, along with his other nemeses, South African Airways chairperson Dudu Myeni and SARS boss Tom Moyane. Gordhan says the hostility from his colleagues was “extraordinary”. Gordhan also did not receive much support from his colleagues when he was under investigation by the Hawks. In fact, the Police Minister at the time, Nkosinathi Nhleko, addressed a media briefing in which he defended the action by the Hawks to send 27 questions to Gordhan on the eve of the 2016 Budget Speech. Surprisingly, Gordhan still exercises restraint and will not hit back at those who plotted to get him out of government. He credits South Africans for ensuring he was able to continue doing his job last year when there were attempts to drive him out, abusing the criminal justice system. “It took the South African public to react in the way they did to defend somebody in government and expose what was a blatant effort to besmirch and denigrate individuals that appeared to be an obstruction,” Gordhan said. Although the onslaught against Gordhan had raged for some time, the events of the last week in March still caught him off-guard. It began with an instruction from the president that he, Jonas and Treasury director-general Lungisa Fuzile should cancel their international investor roadshow. Gordhan says he got the message around 6am as his plane was taxing on the runway at Heathrow Airport and there was no hesitation on his part to do what he was told. As they had to wait for their flight that night, Gordhan and Fuzile continued with their meetings with ratings agencies Moody’s and Fitch, and then over 50 investors, not knowing that the president believed they were involved in some nefarious plot against the country. This he derived from a bogus “intelligence report”, the source of which has still not been established. Gordhan says he and Fuzile still did not know what was coming, but were “bemused” by the message to return home. He says he speculated that it might have had something to do with the Gupta cases that were in court that week. On Tuesday morning, they landed back in South Africa and received no word about what they were meant to do or why they were called back. They also landed to the news that ANC stalwart Ahmed Kathrada had passed on. Gordhan says news then began to circulate that an axe was dangling over them. Heightened emotions and tension gave way the next day at Kathrada’s funeral when Gordhan was brought to tears. 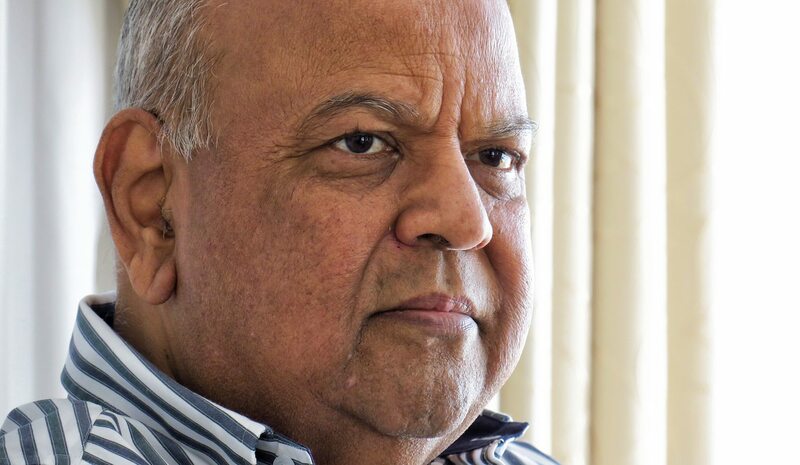 After a series of piercing speeches, including by former President Kgalema Motlanthe, the director of the Kathrada Foundation Neeshan Balton asked Gordhan to stand. Balton told him that when he was to appear in court last year, Kathrada said he wanted to be the first person there to support him. “Pravin, irrespective of whether you are minister or not in days or weeks to come, you remain true to the values and principles that Ahmed Kathrada would be proud of,” Balton said to roaring applause from the audience. Gordhan says he was very moved and humbled. The next day was D Day. Word went out late Thursday that the ANC officials had been called to an emergency meeting at the president’s residence. Gordhan says he did not feel any anxiety when he heard about the 6pm meeting. Gordhan says he responded positively to the request made to him to return to the finance ministry in December 2015 after mayhem ensued on the markets when Nhlanhla Nene was fired. “I was asked to come back. I was asked to use whatever influence I have or capability I have, together with the Treasury team, to calm the markets after Nenegate. We approached that with the right level of diligence and patriotism. We went well beyond our call of duty,” he said. Instead, the country now must contend with two ratings downgrades to junk status. Gordhan says it was hugely disappointing that when South Africa was on the verge of capitalising on the green shoots in the economy, it was downgraded to junk. He says it was well known that what the country needed to do was to create the right kind of climate for local and foreign investors, such as dealing with the rot in state-owned companies, but the opposite was being done. He says the opportunity still exists to focus energies and partnerships to navigate through the current economic difficulties. But the country will be doing so without the dynamic team that existed at the Treasury. Gordhan did not want to comment on the issues affecting his successor, including the controversy over radical economic transformation and the views of ministerial adviser Chris Malikane. But he said the reshuffle had a disruptive effect on senior staff at the Treasury and the departure of Fuzile later this month would have a further negative effect. “He (Fuzile) has been a great leader of an equally great team. He is extremely principled, a top administrator with a great deal of integrity,” Gordhan said. And then there’s his former deputy, Jonas, with whom Gordhan co-piloted the Treasury. The two grew extremely close, particularly in the last year as they fought off multiple attacks. Jonas became a target when he publicly confirmed that he was offered the finance ministry and R600-million by the Gupta family. He was on borrowed time in government thereafter. As Gordhan and Jonas walked out to address the Save South Africa gathering on the day of their departure from the Treasury, they chatted and teased each other. Just before they emerged into the crowd, Jonas put his arm across Gordhan’s shoulder and they tapped their heads together. That kind of bond and mutual affection cannot be faked. “Mcebisi played a crucial role in the Treasury and the PIC (Public Investment Corporation). He assisted me in various tasks and responsibilities. The country has been robbed of his contribution, his wisdom and his insights,” Gordhan said. Gordhan says that the one positive aspect of their 15-month hell ride was that there is a great appreciation of the work of the Treasury among the South African public. He says South Africa should acknowledge people like his predecessor Trevor Manuel and former Treasury director-general Maria Ramos for their leadership, vision and foresight in helping to build the Treasury to be the institution it is, with quality, systems, processes and people that serve the country so well. Gordhan is unsure about his future role in society. His passion lies around the issue of inclusive growth, which he says is at the centre of what needs to be achieved for the country to progress. He says inclusive growth is also a big issue in international organisations and across the world to tackle inequality. For now, Gordhan remains a Member of Parliament and a member of the ANC NEC. Asked how he will vote in the motion of no confidence in the president, which will come before Parliament after the Constitutional Court considers the application by the United Democratic Movement for a secret ballot, Gordhan says he will wait to see how the matter unfolds. “There is a lot of debate. Let’s see how it all unfolds. Conscience is not an unimportant factor,” Gordhan said. He believes that the ANC has a body of ideas that remains relevant for South Africa and says he is optimistic that the party will emerge with maturity and the right leaders at its December national conference. But he says South Africa needs to close the chapter on state capture and for that to happen, all the facts about any illicit activity need to be put on the table. He says he did not know the Gupta family personally and did not have any first-hand experience of what they are alleged to have done. He said while South Africa borrows money, it also has fiscal sovereignty, which has been a hard-fought success to complement our political sovereignty. Gordhan says he has been cast into different roles over the past 40 years as an activist, a public servant and a minister and all of these required building and sustaining public support. His says his past experiences, including his periods of detention, have helped him cope with recent experiences. Gordhan laughs in agreement when his wife Vanitha jokes that he became an “accidental hero” simply by doing his work diligently. Gordhan says he believes the masses make history and will continue to do so. In the midst of the onslaught last year, Gordhan called for public support and South Africans responded to that call. He and Jonas have been inundated with support, particularly after they lost their jobs, and have transitioned into the faces of the resistance against abuse of office, state capture and corruption. “Tomorrow there will be another individual or set of individuals… If they are being victimised in the same way Mcebisi and I have been victimised, they will also enjoy public support because there is that sense of justice,” Gordhan says. ANC secretary-general Gwede Mantashe told a media briefing that headlines referring to the former finance minister as “President Gordhan” contributed to the resentment against him and his firing. Gordhan might see himself as a “backroom boy” but the events of the past month show that his loss from the public service is a tragedy and an outrage. Zuma threw caution to the winds the night he decided to wield his axe against the people who went beyond the call of duty to serve their country. Zuma has repeatedly shown contempt for South Africans, the institutions of democracy and the Constitution. But when he finally sacrificed the country to his benefactors, he scripted his final downfall. Over 40 years ago, Pravin Gordhan and Jacob Zuma were joined in a common struggle against an evil regime. Decades later, they responded to their positions of power in a democratic government in very different ways. All interview photos of Pravin Gordhan by Russell Pollitt.